What Are Your Treatment Options Following a Mesothelioma Diagnosis? If you have been diagnosed with mesothelioma, it means you were exposed to high levels of asbestos at some point over the last 50 years. For most people, the exposure happened in the workplace—whether at a shipyard, during military service, or while working with asbestos-filled construction materials. Other mesothelioma victims suffered secondary exposure when a parent or spouse who worked in one of these industries brought the dangerous fibers home on clothing. Either way, the employer who allowed the exposure to happen can still be held accountable and can be made to pay for the expensive treatments and other losses you are now facing. 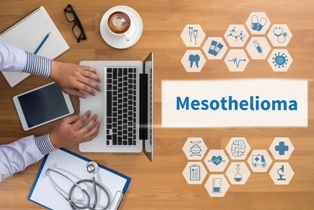 A diagnosis of mesothelioma is devastating and, while there is no cure, there are treatments available that can extend your life and ease your pain and suffering. As you work with your doctor to lay out the best treatment plan for your unique case, contact the mesothelioma attorneys at Neblett, Beard & Arsenault to get started fighting for the compensation that is available to you. You will not owe us any money to get started. If we win on your behalf, our fee will come out of your settlement, not out of your pocket. Mesothelioma is a cancer that can affect the sensitive lining—called the mesothelium—of several vital organs. The most common form of the disease is pleural mesothelioma, which affects the lining of the lungs. This disease is caused by inhaling asbestos fibers, which become lodged in the mesothelium of the lungs. Over many, many years—on average, about 50 years—the fibers cause cancerous cells to begin to grow. By the time the disease is diagnosed, it is usually too late to cure the cancer. Mesothelioma can also affect the lining of the abdomen (peritoneal mesothelioma) or the heart (pericardial mesothelioma). Your treatment plan will depend on where your cancer is and how advanced the disease is. Surgery. If possible, cancerous masses may be removed by surgery. However, because mesothelioma affects vital organs, surgery can be very difficult. If the cancer has spread throughout the body, the patient may be too weak to withstand surgery. In some cases, organs that have been completely compromised by disease may be removed to ease suffering. Chemotherapy. Chemo may be used before or after surgery to shrink the cancer that is there and prevent further spread of the disease. The side effects of chemotherapy include nausea, fatigue, hair loss, anemia, and body aches, but it can be very successful in extending the life of the patient. Radiation. This treatment involves exposing the malignant tumor to controlled beams of radiation, which can shrink the tumor and kill cancer cells. This is usually used in conjunction with either surgery, chemo, or both. The treatment your doctor chooses for you will depend on a variety of factors, including the type of cancer, the stage of the disease, and your age and overall health. However, the cost of treatment should never be a factor as victims of asbestos exposure are owed compensation for the harm that was done to them. As you discuss treatment options with your doctor, allow our mesothelioma legal team to pursue the damages you need and deserve. These therapies may not be covered by traditional health insurance plans, but with the settlement, you are owed for the harm that was done to you years ago, you can cover the cost of these comforting and restorative treatments. Mesotherapy. This experimental treatment involves injecting plant extracts into the patient’s fat cells. It has shown some promise in preventing the disease in people who have been exposed to asbestos rather than those who have already developed cancer, but does not yet have FDA approval. Immunotherapy. This treatment has been successful for other forms of cancer and is in clinical trials as an option for mesothelioma treatment. In this treatment, a bacteria such as Listeria is introduced into the patient’s system with the hope that it will attack the cancer cells. Gene therapy. While researchers are actively pursuing this form of treatment, which involves replacing the faulty genes in cancer cells with healthy ones, it has not yet been successful for mesothelioma. Groundbreaking research into mesothelioma treatment is happening all over the world. Do your own research and talk to your doctor about possible options for you. Neblett, Beard & Arsenault represents mesothelioma victims throughout the country and can assist you immediately. We will handle all of the critical details, including access to Social Security disability benefits on an expedited basis. Our goal is to help you navigate the legal system and protect your right to fair compensation. Contact us at (318) 561-2500 today to schedule a consultation and request a download of our free book, Understanding Your Rights After a Mesothelioma Diagnosis.